Choose this pre-configured grouping or have a unit designed specifically for your space. Available in a multitude of colour combinations. Contact your furniture specialist to discuss your options. Right Corner Bookcase. True White/Chocolate Walnut. 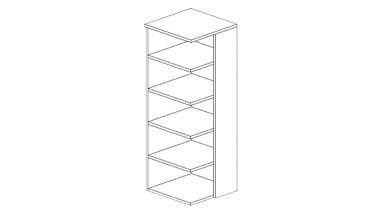 Features 4 shelves. 24"W x 24"D x 66"H.